While in decades past some may have described Indiana as a sleepy Mid-Western state, the progress of the new millennia has shown that Hoosiers have made wise investments in the future. One such decision came from the joint efforts of Governor Daniels and Mayor Ballard who in 2011 paved the way for Project Lead The Way to transition its headquarters from upstate New York to central Indiana. Project Lead The Way is a non-profit organization that provides a transformative learning experience for K-12 students and teachers across the U.S. The organization partners with public, private, and charter elementary, middle, and high schools to provide engaging STEM (science, technology, engineering, and math) curriculum for students. Furthermore, they provide a professional development model that provides teachers with the content and pedagogy needed to engage students in activity-based learning. Additionally, Project Lead The Way connects educators with community and corporate partners who share a vision for increasing STEM competencies in students across the nation. In 2011, when Project Lead The Way hired former Indiana Evansville Superintendent Vince Bertram as its Chief Executive Officer and President, an opportunity presented itself to Daniels and Ballard. At the time, PLTW was working in 4,200 schools across the country including 350 middle and high schools in Indiana. Vince rose to the top as a strong leader capable of guiding the bow of PLTW into its ambitious future. His degrees, honors and references are extensive. Vince earned his doctorate, specialist, master’s, and bachelor’s degrees from Ball State University. He completed an additional master’s degree in education policy and management from Harvard University, an executive certificate in strategy and innovation from the MIT Sloan School of Management as well received an honorary doctorate in engineering from the Milwaukee School of Engineering. 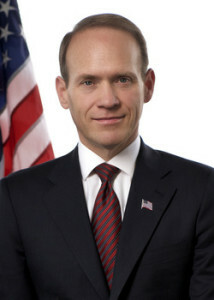 In 2014 he was appointed by the U.S. Department of State to serve as the STEM education expert for its United States Speaker and Specialist Program. He was honored by the Harvard Graduate School of Education with the Faculty Tribute Award for his contributions to the intellectual life of the program, and was named a “Distinguished Hoosier” (one of Indiana’s greatest honors) by former Governor Mitch Daniels. Vince is the author of New York Times bestseller, One Nation Under Taught: Solving America’s Science, Technology, Engineering and Math Crisis as well as a frequent contributor to the Huffington Post alongside many other national publications. Why did PLTW move to Indianapolis rather than stay in New York? “Indianapolis had a great interest in moving us here. Governor Daniels and Mayor Ballard offered us both state and local incentives that made it a very attractive opportunity. Also, it was an opportunity for us to engage at a state level. The educational landscape of Indiana is, arguably, one of the best in the nation. This is because we’ve adopted one of the most aggressive school reform packages in the American public education system. Furthermore, there are people that are truly committed to the success of the state and we are excited to be a part of that vision. Tell me about PLTW. Is it a supplementary educational program? “I wouldn’t say it supplements so much as applies the knowledge that is often learned in other courses. We teach an activity- and project-based curriculum in engineering, biomedical science, as well as computer science. We have a k-12 pathway in each of those areas. Rather than thinking about content knowledge or learning in isolation, we create a space for students to apply the knowledge they’ve learned to real-life problems. We make their learning relevant by showing them real-world examples of how what they are learning today really matters. We help them to understand that the skills they are developing are not to take a test, but rather to solve real-world problems. Wow, your program sounds really fun! As you were growing up, do you wish a program like this had been available? How did your teachers inspire you? “As I reflect on my growing up years, things were tough. My dad had left us, and it was just my mom raising my sister and me. My mom had to work multiple jobs to make ends meet and we moved frequently to escape eviction. Yet I was lucky because I had teachers and others who believed in me. That gave me great sense of confidence. And even if it wasn’t in algebra, it gave me a sense of confidence in my abilities to do other things. I remember one of my teachers pulled me aside one day and told me “You may give up on yourself, but I will never give up on you.” In the end, you don’t remember algebra class; you remember what someone said to you during your sophomore year of high school. You remember a specific conversation that inspired you, one you can recall and say that event changed who I am or gave me the confidence to do x. Those are powerful moments. It is those moments, and their power to influence a life, that we remind our teachers they are capable of cultivating. We strive for them to understand that every interaction they have with a child matters. What they do, and how they inspire them is critical. It was through those interactions that I realized I wanted to be an educator. I wanted to teach, I wanted to coach and it led me to a very positive career path. For me it wasn’t so much the experience that I was contemplating, it was really the idea of affecting other people’s lives. I would wonder, “How can you use education to empower others and improve the quality of life for those you meet?” And each move that I had made in education, each degree earned, extended that reach. The opportunity to reach more students has grown with each experience and that’s been very positive for me. How did you first get involved with PLTW? “I was introduced to PLTW when I was a high school principal in the early 2000’s. It became clear to me that this was a transformational experience for students. The students were engaged and excited about learning, they were going onto higher education, and they had high expectations for themselves. What are the obstacles facing education today? “The number one issue is a culture of low expectations. We do not expect enough of our children. Our children are capable of doing things well beyond where we place the bar. We need to place the bar higher for them, and help them to develop the type of skills they need to be successful in life. While this discussion can get into a nuanced arena regarding the unique trials faced by each school system, in the end, children are children. If you are in a small rural school, one of the troubles can be attracting high quality teachers. That limits the students. If you are in a small school and you have one teacher teaching a subject, then you are also limited. But, I am not a believer in the idea that we lack resources. We invest a lot of money into K-12 education. I believe we have to reprioritize and find the things that supply the greatest benefits and values to our students. Then you also get into places where the overall environment is challenging. Did you know that students only spend about 15% of each year in school? The rest of their time is spent outside of school. It’s very rare for the conditions outside of school to be changed positively by the time the children spend within school. Children don’t have that power. And that’s a challenge for schools. Poverty is an issue, but not an excuse. We use the conditions for children as excuses for why they can’t or aren’t doing things. We shouldn’t do that. We need to have high expectations. Yes the conditions are different, but what does that mean? What would be your vision for PLTW five years down the line? “Our goal is to look at what this organization could be in ten years and figure out how to make it happen in five. What are those accelerators? For us, it comes down to our goals as an organization. We want to expand access. We want to create engaging, inspiring and empowering student experiences. We want to transform teaching and this year we have trained about 10,000 teachers in PLTW. Understand that in 2012 we trained 2,000 teachers and were in about 4,200 schools across the nation. This year we are in about 8,100 schools and in nearly 3,000 school districts in the U.S. It centers on our goal of expanding access. We are constantly looking at ways we can improve access. What this means for us is we need to understand the challenges confronting schools. We need to understand what challenges the system is perpetuating and what challenges we can help the school systems over come. It’s funny, we teach problem solving, critical thinking, collaboration and communication, and if we are going to teach those things we should make sure to do them ourselves. If access is a goal then it’s incumbent upon us to make sure that we are eliminating barriers for our students. My goal for this program is to make sure that every child in America has access to PLTW. Now, everyone may not choose to use that access, and I am fine with that. But I want to make sure that they have access nonetheless. We’ve started to target school districts and if we can get into every school district in America then every student really does have access to us. What would you say defines a good citizen? PLTW is eager to continue expanding access to students through their five program areas. They are continually being recognized by peer organizations for their excellence in the field of STEM education. They recently received the Silicon Valley Education Foundation’s STEM Innovation Award. They were one of four organizations honored at this annual event last month. PLTW next major project will be to bring together more than 1,500 educators, students, and government and business leaders for the PLTW Summit 2016. The Summit will take place March 20-23, 2016, in Indianapolis at the JW Marriott. It provides a wonderful opportunity for individuals who are passionate about empowering students to thrive in an evolving world to come together and discuss how they can best prepare students for the in-demand jobs of today and tomorrow. Registration is now open and PLTW has a great lineup of speakers, with more to come. If you are interested in attending the Summit, or would like to learn more, click here: www.pltw.org/PLTWSummit.